No matter the time of year you get married, it will undoubtedly be a beautiful seasonal wedding. There are unique ideas for decor and favors for each season, making it impossible to pick which season to get married in. One of our favorite wedding seasons is once the traditional wedding season is actually over, in the autumn. The vibrant colors and cool air are irresistible. The fall season is absolutely unique, and it offers up some of the most beautiful wedding favors you could imagine. Here are a few of our favorite fall themed wedding favors! Everyone loves candy apples, and offering them up as wedding favors is a perfect idea. You can take it a step further, and make it easier on yourself, by having a candy apple making station for your guests to make their own to take home. This way, you don’t have to worry about making and packaging up hundreds of candy apples. This is also a great halloween themed wedding favor. One of the most iconic parts of fall, is the apple orchards and harvests. Apple butter is a personal and thoughtful wedding favor. Create custom labels with you and your spouse's name, and information about the wedding, to make this favor even more special. An inexpensive fall favor idea will still be greatly appreciated by your guests. Your initials accompanied by the date of your wedding on a simple, small matchbox make a perfect and practical fall wedding favor. Hand in hand with apple butter, jam is a great fall favor idea for your wedding. Choose your favorite seasonal fruit and have your aunt cook up a big batch of jam with cute custom labels, and a bit of decorative twine tied around the top of the jar. Is your wedding theme rustic? A compass is the perfect fall wedding favor for a rustic wedding. If your wedding is set in the woods, send your wedding invites out tied to a beautiful compass, to help them find their way. Everyone loves a batch of locally sourced honey, it goes with everything. If jam isn’t really your jam, perhaps package up individual jars of honey for your guests inside! How sweet. How cute is a mason jar filled with crunchy caramel popcorn? The perfect fall treat, this favor will go over well with your guests, making it a favor that they’re actually excited to take home. What better way to enjoy a warm, spiced cider than with a mug celebrating your wedding day? A practical and budget friendly gift that your friends will keep in their cupboard and use for years to come, a mug printed with your wedding day and initials will be stunning as a fall wedding favor. 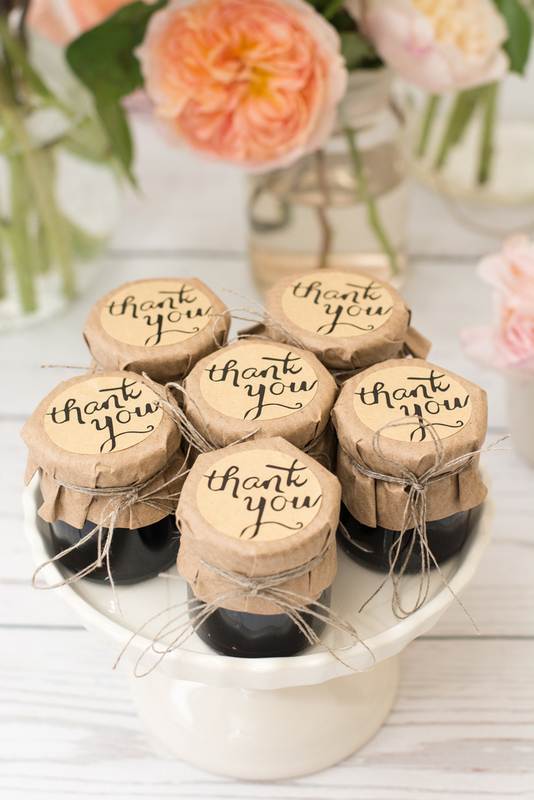 Can you tell that we think perishable favors are the trendy wedding favor that is here to stay? Pack your favorite loose tea or coffee bean in a decorative mason jar, and let them know there’s enough “tea for two” or thank them for “bean your guest”. A small contained filled with your favorite(or homemade!) hot chocolate mix, and topped with mini marshmallows, is a sweet wedding favor to send home with your guests. You can take it to the next level by tying a small bottle of baileys(or your favorite alcoholic mix in) to each container to accompany the hot chocolate. Do you have an affinity for candy corn? Or any other festive halloween candy? Gift your guests with a small bag of them with a tag telling them that you’re so thankful that they could join you for their special day. No matter what festively fall favor you choose, make sure that before the end of the night when guests start leaving, that you have your DJ or band announce to your guests that they should grab a favor before they leave. All too often, guests forget to grab their favors and then you’re left with dozens of extras and no idea what to do with them.